"If a kingdom is divided against itself, that kingdom cannot stand". These words of wisdom are attributed to Jesus Christ himself. Zimbabwe is one such Kingdom trying to find balance on shaky tribal grounds. At the epicenter of the problem is the unwise "king" who keeps partitioning his kingdom along tribal lines. 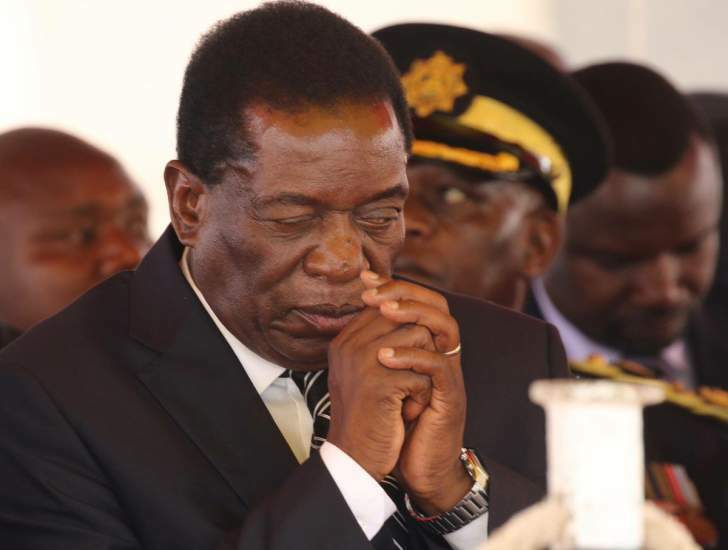 Now, Mnangagwa howls like a troubled dog as Matabeles demand the reinstatement of Matabeleland statehood that was lost in 1893. No one will baby sit him in Matabeleland! "I am aware of elements who preach secessionism, pasi navo(down with them)," Mnangagwa cried out last weak at a Zanupf conference. Chickens have come home to roost. The man who has been sowing seeds of tribal division since 1980 is now tasting the bitter fruits of tribal hate. In the 1980s the then Minister of Information, late Nathan Shamuyarira would call Matabeles "extras not needed in Zimbabwe" while Mnangagwa referred to us as " cockroaches that needed extermination". He even demonstrated his hatred by conniving with other genocidists to send Zimbabwe National Army 5th Brigade to kill more than 45 000 Matabele civilians. In the face of Matabeleland restoration calls, Mnangagwa parrots Zimbabwe as an unbreakable unitary state and imposes the so called economic devolution on Matabeles. If l may ask, are we no longer unwanted cockroaches or extras? Since when, is it before or after calls for Matabeleland restoration? We are not that gullible to fall for these clear lies aimed at keeping us under shona supremacist oppression. This must be known to Mnangagwa, all shona supremacists and their supporters: Matabeles have the right to restore the statehood of Matabeleland and enjoy their long lost independence and sovereignty. Its called self determination, a basic right that should be enjoyed by every living human being. And if we so wish, we may consider one of our friendly neighbours, that is, Zambia, Botswana and South Africa to join for administrative and economic reasons. This is called freedom of choice and freedom of association which Matabeles should enjoy too. We hope Mnangagwa who has confessed publicly that he is aware of our intention to revive Matabeleland state is also aware that we have freedom of choice and association. Zimbabwe which has maintained its anti Matabele stance for 38 long years, is not, and will never be our choice to form a union or whatever partnership. So Mnangagwa must stop foistering the so called unitary state and economic devolution on us. On the same breath the 1923 amalgamation of Matabeleland and Mashonaland by imperial forces was illegal and without the blessing of both Matabeles and Mashona people. The 1987 unity accord that was signed by Joshua Nkomo of ZAPU and Robert Mugabe of ZANU was an affair between two Zimbabwean political parties. It has got nothing to do with the people of Matabeleland. Who in Matabeleland cares about what happens in a foreign country like Zimbabwe? Furthermore, Zimbabwe is an unattractive country to form any kind of union with due to its history of genocide, gross human abuse, institutionalised tribalism, corruption, military coups, failure to manage the economy and uphold the constitution. We do not want to be associated with this continuous humiliation, enough is enough! Matabeleland is going away with a vast amount of land, not barren at all. As per marked territorial boundaries, Matabeleland measures 45 749 680 acres. Geographically we are bigger than Lesotho, Eswatini, Rwanda, Burundi, Seychelles, Gambia, Belgium and Comoros, all combined. Our economy is enough to sustain our population of + 5 million people which is almost half of Zimbabwe's population of +13 million. And bigger than that of Botswana, Namibia, Lesotho, Eswatini, Equatorial Guinea, Gambia, Seychelles and Comoros. It is this abandant wealth that invited white colonisers that destroyed the Kingdom of Matabeleland in 1893 and the same that sends Mnangagwa howling like a troubled dog at hearing calls for Matabeleland restoration. Matebeleland is endowed with the following resources which can generate employment and economic resources for its development and growth pointing to a US$50Billion economy in the first 10 years of independence and full sovereignty. The Zimbabwe Chamber of Mines has confirmed that over 60% of gold output in Zimbabwe comes from Matebeleland. Matebeleland enjoys huge deposits of platinum in Shabani areas,Chrome in Guinea Fowl, Selukwe and Shabani areas,diamonds in Beit Bridge,Somabhula and Tsholotsho areas,nickel in Shangani, tin in Kamativi, large iron ore deposits and emerald in Belingwe, and other minerals like tantalite,copper,etc. Matebeleland is home to hard timber like teak,mukwa etc in Victoria Falls,Lupane,Insuza,Kwekwe,Tsholotsho and Nkayi. Matebeleland is home to largest game park after Kruger National Park in South Africa which is home to the big five well sought animals ie elephants,lions,rhinocerous,buffalos, leopards and corterie of other wild animals and birds. Victoria Falls is the prime source of tourism and holds many international conferences .Other tourist sites include Matopos where the leader of the British Pioneer Column Cecil John Rhodes and King Mzilikazi are buried, Khami ruins,Dlodlo ruins,Old Bulawayo,Shangani. Battlefields where Matebele army fought the British imperial forces are to be turned into tourist sites. The best beef which enjoys a good market in the European markets through its quota allocation can be developed in Gwanda,Collen Bawn,West Nicholson and Kezi catchment areas and along the border with Botswana. This industry has been destroyed by President Robert Mugabe land reform programme resulting in the loss of downstream industries like leather tanning and leather manufacturing,taxidermy etc. Matebeleland offers great opportunities in ostrich and crocodile farming which is a very lucrative industry given the low cholesterol levels in the meat would find some niche markets in Europe, America and Asian countries. The Zambezi water project, once implemented, would provide a green belt that would create new opportunities in crop and animal husbandry that would stretch from Victoria Falls to Bulawayo and possibly to other places like Gwanda, Plumtree,Kezi, Nkayi etc, with hotels and leisure resorts facilities being built along the way to offer conference and entertainment facilities. Sugar cane can be grown in Beit Bridge and so are oranges. Cotton can be grown in areas likeJotsholo,Tsholostho,Plumtree,Kezi,while virginia tobacco can be grown in places like Victoria Falls,TsholotshoNkayi,Whange with the Zambezi river project supplementing water requirements. for both light and heavy industries which would need to be rehabilitated through promotion of good and friendly investor policies which Matebeleland Liberation Organisation provides in its econonic policy charter. The charter provides for high tech industries through comparative advantage and respect for private property rights underwritten by friendly policies that permit free remittances of one's proceeds and allow free flow of capital and equity and bilateral investments agreements. Matebeleland boasts two international airports,Bulawayo JM Nkomo International airport and Victoria Falls airport and various small aerodromes and airstrips. of Zimbabwe ably supported by serviceable transport and communications network sytems,vibrant commerce and ancillary services which would be manned by highly skilled personnel from Matebele nation. This dismisses the falsehood peddled by our enemies that Matabeleland is small and not able to stand on its own. Matabeleland was able to feed its populations during its years as a kingdom under his majesty King Mzilikazi and Lobhengula and will do even better as a Republic under MLO government. The oppressor fears freedom of the oppressed more than anything in the world. We are not surprised that Mnangagwa is the first to press panic buttons at the mention of Matabeleland restoration cause. However, as a hero of two struggles himself ie war for Zimbabwe independence and military coup that deposed Mugabe, he knows too well that nothing can stop the idea whose time has come.